FS2000™ liquid, proprietary to HLF, is 30% MgCl2 with an organic derivative specifically engineered to enhance the eutectic (lowest melt temperature point, anti-icing properties and viscosity of magnesium chloride. It's eutectic point is an incredible -85°F! 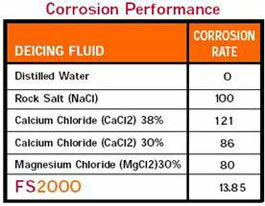 FS2000™ passes TM-01-69 testing established by the National Association of Corrosion Engineers, which sets PNS specification at 70% less corrosive than salt.